PennsylvAsia: Japanese tea ceremony, music, at CMU on April 17. 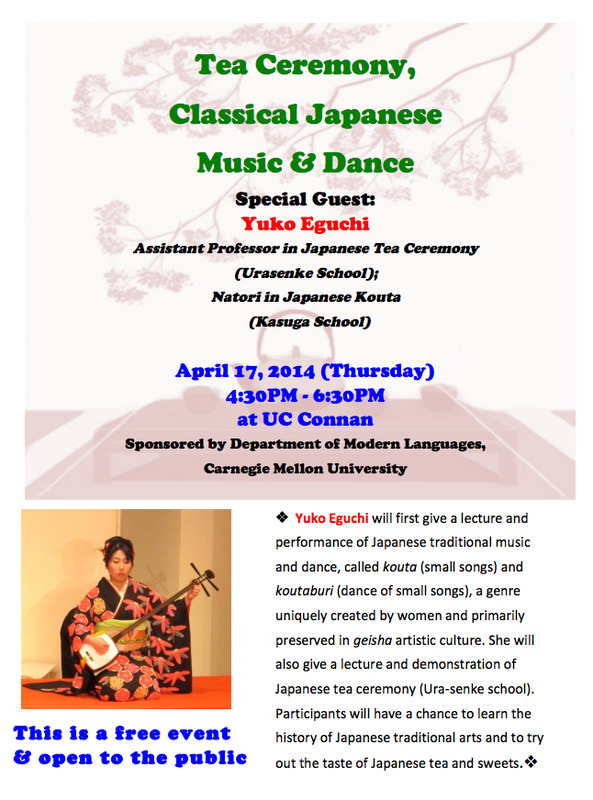 The Department of Modern Languages at Carnegie Mellon University presents an evening with traditional Japanese music and a tea ceremony on April 17 from 4:30 to 6:30 pm. 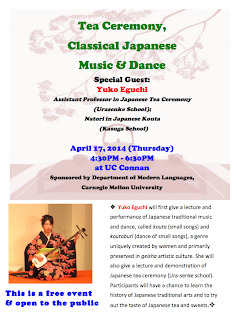 Yuko Eguchi will first give a lecture and performance of Japanese traditional music and dance, called kouta (small songs) and koutaburi (dance of small songs), a genre uniquely created by women and primarily preserved in geisha artistic culture. She will also give a lecture and demonstration of Japanese tea ceremony (Ura-senke school). Participants will have a chance to learn the history of Japanese traditional arts and to try out the taste of Japanese tea and sweets. The lecture and performance will be held in the Connan Room of University Center (campus map).